In 2008, the Royal Shakespeare Company (RSC) relaunched its far-reaching, far-sighted education work with a three-prong manifesto called Stand Up For Shakespeare. It set out a way of engaging young people with Shakespeare and it is very simple. The RSC believes that you should start it earlier, do it on your feet and see it live. Enter the charity, Shakespeare Schools Festival, which has been living the tenets of that manifesto since 2000 – eight years before it was published or thought of. Since a modest beginning with eight schools in Wales, the scheme, which allows and supports teachers to, say, put on a Shakespeare play with under-10s or do Julius Caesar with a special needs group, or get those adolescent rebels busy with Macbeth, has reached more than 230,000 young people nationwide. And this is the term when it all hots up. Pupils and teachers who are signed up to the festival return after the summer holiday to an intensive rehearsal period. More than 1,100 schools, including more than 100 special schools, are involved in 2016. The casting and preparation will usually have been done last term so the work now begins in earnest. The really exciting part happens in November. Then, for each school, there will be a performance festival at one of 100 or so professional venues. Each performance festival consists of four shows presented by four different schools. In 2016, the Shakespeare Schools Festival is set to reach more than 35,000 young people across the UK. One of the special schools on board this year is New College, Worcester – a residential secondary school for blind and partially sighted students – which is taking part for the first time. 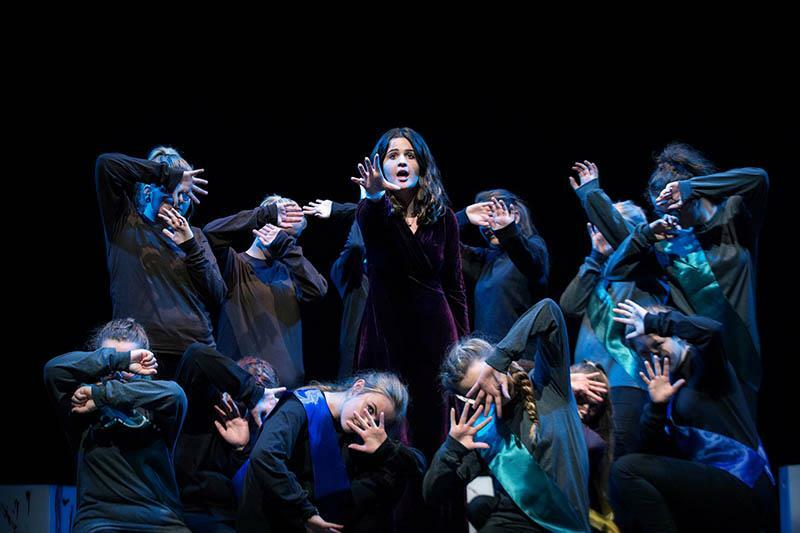 “It will be an all-age production from year 7 to age 19,” explained head of drama, Lucy Rix, who is expecting her festival theatre venue to be either the Belgrade in Coventry or the MAC in Birmingham. “Drama is tremendously important for our students. It develops body language and facial expression which they can’t acquire from visual observation,” Ms Rix continued, adding that they also learn how to move confidently round spaces which they can’t see. Ms Rix is also aware that students with visual impairments being educated in a boarding school tend to get into a bit of a bubble meeting only each other. At Malmesbury Primary in west London, teacher Sidé Underwood is involving year 4, 5 and 6 children in the festival for the third time. 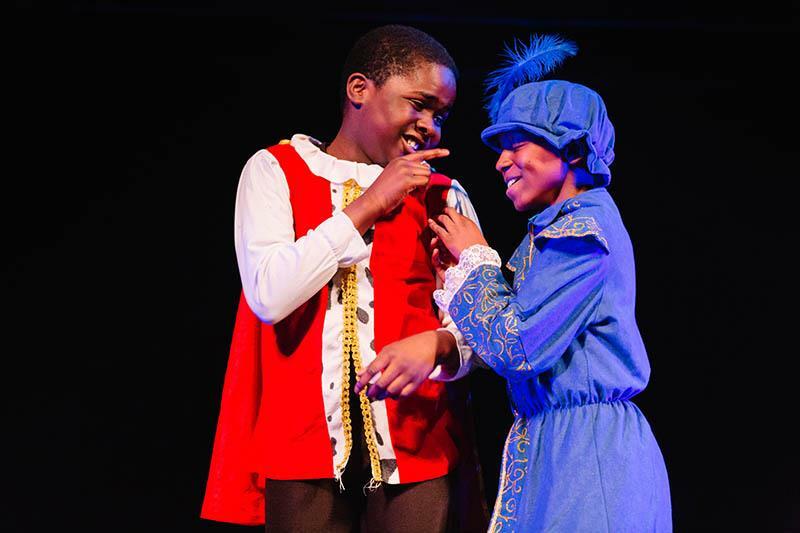 In 2015, the children, who do most of this work as an after-school club, performed The Tempest, and they have been rehearsing their new play, A Midsummer Night’s Dream, for the November festival at the Secombe Theatre in Sutton, since the beginning of term. The Shakespeare Schools Festival provides the abridged, 30-minute script of the agreed play. “We can state a preference but there also has to be a bit of negotiation,” explained Ms Underwood, who did Romeo and Juliet in her first year with the project. The package includes a lot of support and training. There are CPD workshops for teacher-directors led by skilled professionals, advice and on-going support from an assigned regional member of Shakespeare Schools Festival staff. 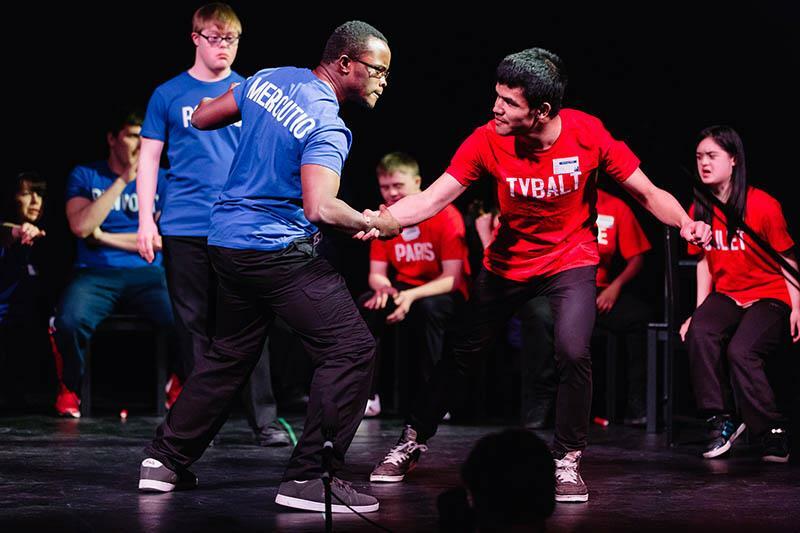 Teachers are given imaginative ideas about directing quite large ensembles and guided through potentially tricky processes such as casting which will be new to some. And there is probably as much benefit for teachers from different schools in getting together to explore ways of “doing” Shakespeare actively as there is for the mixing of the students at the festivals. The icing on the cake, though, is definitely the thrill of performing in a “proper” theatre. Some of the children involved have never been inside a theatre before and many of the schools involved lay on transport to get families there to support their children, because it is often a new experience for parents too. “It’s our policy to make each festival as diversely mixed as possible,” added Ms Brock, herself a former Tower Hamlets teacher. “We mix secondary and primary, academies, special schools and so on. So on the night, and at the preceding rehearsals at the venue, the casts meet lots of people in different situations. “Some schools use it as a way of easing transition from primary to secondary. For example, the actors can be cast in the final term of primary by their new secondary teachers ready to rehearse and perform as soon as they begin at the new school. The cast at Malmesbury Primary glows with disciplined enthusiasm and commitment: “It’s a great testament to how seriously they take it that most of the line learning is done at home with support from parents,” said Ms Underwood. And that seriousness shines out of them: “It’s like magic. It transforms our ordinary gym into the sea and an island when we rehearse,” observed one girl. “And it makes you feel so proud!” declared a boy whose friend tells me that the work has helped her beat her stage fright. Several children are keen to tell me that “doing Shakespeare” has helped them to improve in other subjects too. And yes, they are all hoping that they will get more opportunities to take part in the festival when they transfer to secondary school. Every single student and adult I’ve discussed the Shakespeare Schools Festival with has mentioned confidence. If you can stand up in front of hundreds of people and do Shakespeare – still mistakenly perceived by so many to be posh, difficult, elitist, boring and the like – then you can do anything. And Ms Brock remembers one of her Tower Hamlets pupils, who hadn’t previously even thought of university, saying: “Now that I’ve done Shakespeare Schools Festival, I can be a doctor.” No further testament needed.